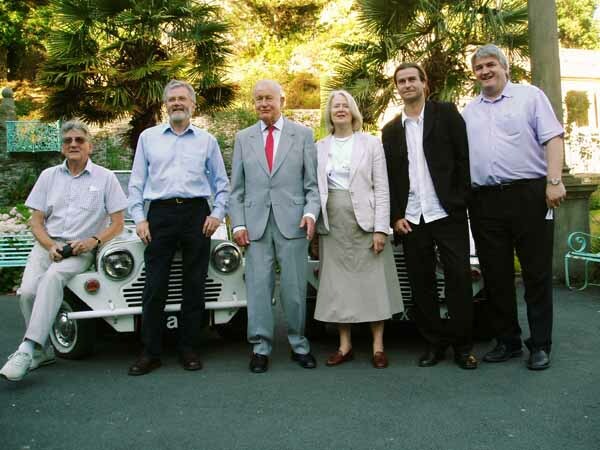 A one-day celebration of Patrick McGoohan, "The Prisoner", "Danger Man", and Portmeirion. 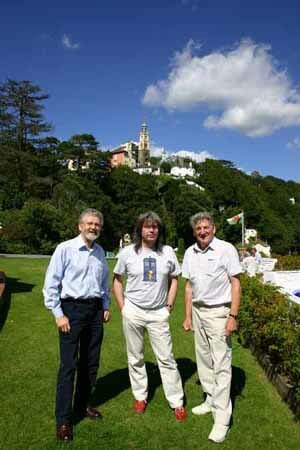 SUNDAY 7TH AUGUST 2005, THE HOTEL PORTMEIRION, In aid of Ty Gobaith Children's Hospice. Organised by The Unmutual Website, and PrizBiz. Report by Rick Davy, with thanks to Frank Shailes. Photographs by Rick Davy, Giles Kendrick, Erica Kendrick, Ronnie Soo, David Mackenzie, Ann Pearce, Steve Mackay, Alan Jones, and Nick Bennett. Nick worked tirelessly throughout the day taking photographs for this report and we would like to thank him for his efforts. Nick, The Unmutual Website salutes you! 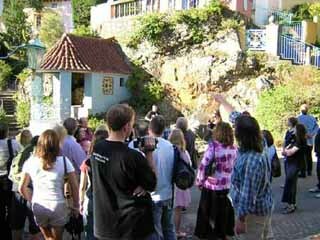 On Sunday 7th August 2005 at 11.30am, Portmeirion's Hercules Hall was filled to capacity as event MC Dave Jones officially opened "PM2005" - a one-day celebration of Patrick McGoohan, "The Prisoner", "Danger Man", and Portmeirion. Fans from all over Europe had applied for tickets to attend the sell-out event, with a packed programme of events, and no less than 4 special guests. 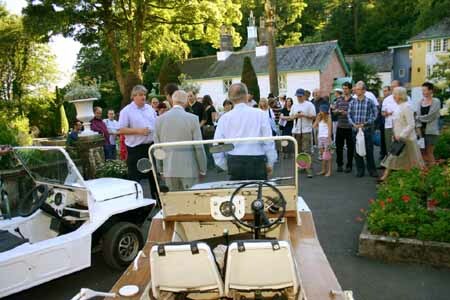 The event, co-organised by The Unmutual Website and PrizBiz with the kind permission of Portmeirion and Granada Media, was held in conjunction with Ty Gobaith - a North Wales-based hospice for the care of terminally ill children, with all profits from the event to be donated to the charity (total raised declared later in this report). As ticket holders arrived at the hall from 11.00am they were presented with a 12-page event programme, and a fiendish Portmeirion picture quiz before making their way into the hall for the start of the days events. 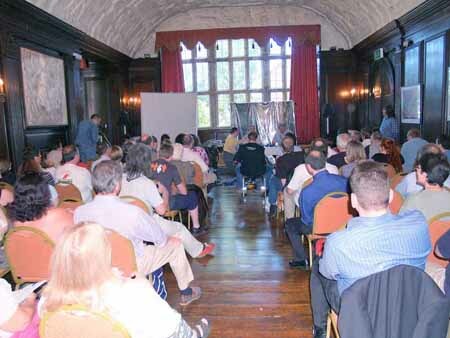 A capacity-filled Hercules Hall at PM2005. First up was an interview with our first special guest, TV historian and writer Robert Fairclough. 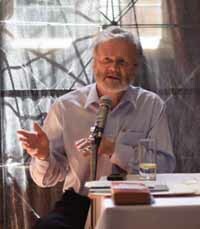 Robert outlined his experiences of writing and researching his "Prisoner" and "Danger Man" books, and gave us all a sneak preview of his forthcoming projects related to both series (including the second volume of his collection of Prisoner scripts, due in December). The highlight for me was when Robert produced "The Odham's Encyclopedia for Children" from his collection of goodies - the actual book used as the storybook in the episode "The Girl Who Was Death"! Rob's wonderful impersonation of McGoohan (who had telephoned him on completion of his Official Companion book) was also a great moment. We would like to thank Rob for attending and supporting the event, staying all day to sign copies of his various publications, and waiving his expenses to benefit the charity! 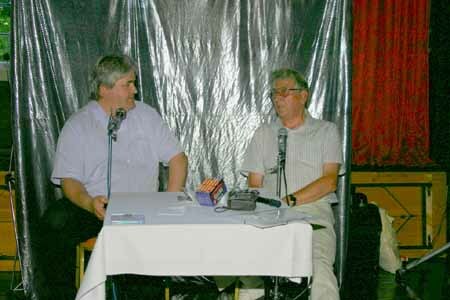 Rob Fairclough interviewed by Dave Jones at PM2005. Next up was the first of several special screenings - the Umbrella Entertainment version of the "Danger Man" episode "View From the Villa", complete with audio commentary by writer Brian Clemens and Director Peter Graham Scott. With all our special guests attending the screening, the 25-minutes flew by as the audience heard anecdote after anecdote concerning the making of the series, and working with McGoohan. Our second special guest then took to the stage. Eric Mival was Music Editor on 13 episodes of "The Prisoner", and Assistant Film Editor on another 3. He gave the packed audience a fascinating insight into how the music for the series was selected and the 60-minute chat whizzed by. 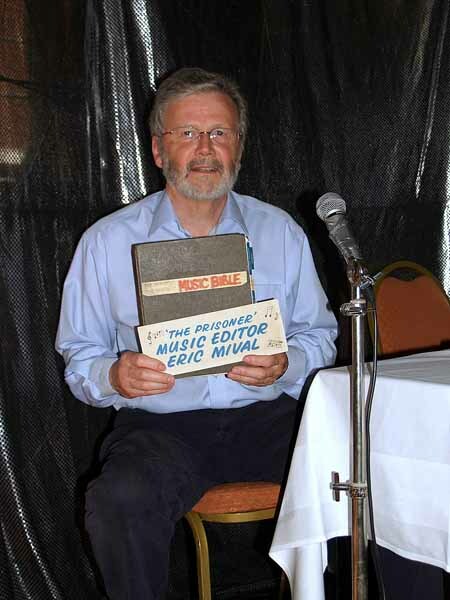 Eric was kind enough to specially film (and bring) the series' "music bible", and this was shown on the big screen, as was footage produced by Eric in the 1970s for a Russian documentary - with none other than Patrick McGoohan providing the voice over! Eric's remembrances were fascinating, and through the use of his footage of the music bible almost covered the series from start to finish, including interesting information regarding the rush to get "Fall Out" and "Living in Harmony" finished on time. From Albert Elms' near-monopoly on the music used in the series to Robert Farnon's original theme tune (which can be briefly heard in "The Champions" episode "The Beginning"), Eric's "Prisoner" music knowledge was almost endless, and also entertaining to boot - his recollection of being asked by McGoohan "as a young person, do you think The Beatles are timeless?" just one example. Eric Mival and Event MC Dave Jones share a joke. Eric Mival and his Music Bible. With all our guests in the hall at this time, a short signing session followed. 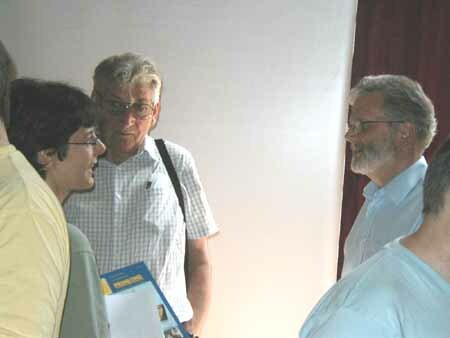 Peter, Eric, and John sign autographs and chat with attendees at PM2005. It was then time for lunch. With the skies above Portmeirion brighter and bluer than ever, many took time out to laze or walk around the village, some taking in its unique atmosphere for the first time (this being their first visit to Portmeirion). 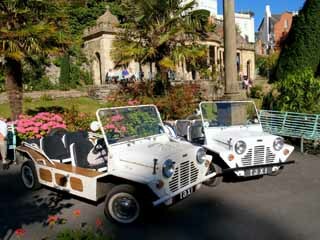 As the silver band were playing in the Colonnade, two Mini Moke Taxis (similar to those seen in the "The Prisoner") were on hand to ferry attendees and day visitors around the village. Sam Denham and CH with their Village Taxis. Sam Denham and CHs' Mini Mokes in action at PM2005. Others took the chance to spend time in the Hercules Hall bar, or to enjoy the attractions in the side room of the Hall. 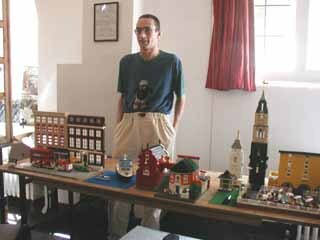 David Mackenzie was displaying his full range of "Prisoner" and Portmeirion Lego models (more details and pics at http://www.priz.co.uk/build), the backdrops for Pam Buckle's infamous Number Six Cottage replica were on display, and no less than 3 stalls of "Prisoner" and Cult TV merchandise were selling items. 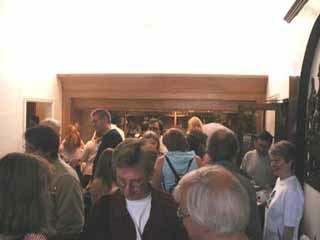 Left: A packed Hercules Hall bar. Centre: An overflowing dealer room. 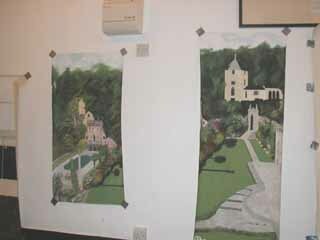 Right: Prisoner Attic backdrops display. At 3.00pm it was time to re-enter the main hall again for a very special screening. TV expert Simon Coward gave some background information to those present, and introduced "The Greatest Man in the World", a 1959 TV play starring Patrick McGoohan. The play, never released or re-shown since the 1950s, which won McGoohan the coveted TV Actors' Guild Award for that year, had the audience in stitches as the tale of the first man on the moon played out on the big screen. It was then time for our 3rd special guest, John S Smith. John was film editor on several "Prisoner" episodes and regaled the audience with his experiences of working with McGoohan on the series, including his work on "It's Your Funeral", "The General", and "Dance of the Dead". John, softly spoken and interesting throughout, revealed many previously unheard details, including that the village of Stourhead in Wiltshire was mooted as a possible replacement for Portmeirion filming! John covered a typical day in his life as a Prisoner editor, and his recollections of scenes he directed himself on the studio floor for "The General", involving the Professor's Wife "pondering" and the spinning "Speedlearn" device . He also mentioned his music editing in the early days, and his experiences of working on series such as "The Sweeney", "The Professionals" and the James Bond film "A View To A Kill". 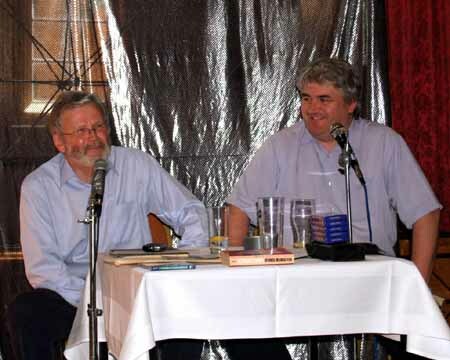 John, as always, made a fascinating guest and one favourite anecdote of those present was him recalling that one evening Patrick McGoohan, slightly worse for drink, ordered a list of re-edits. John and his colleague couldn't remember them all, and simply hoped that he wouldn't either! 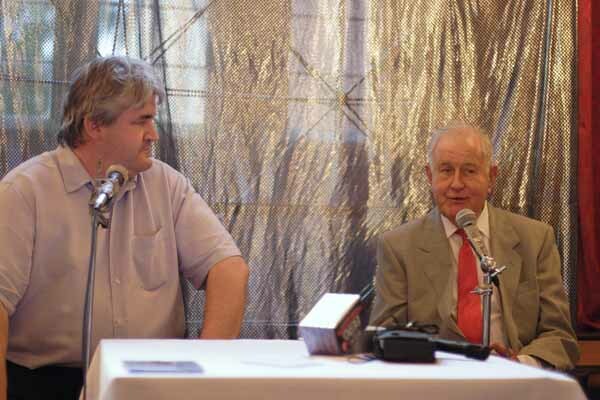 Dave Jones interviews John S Smith. Another screening then followed, the 1956 episode "The Outsider" from "The Adventures of Sir Lancelot" which featured Patrick McGoohan in one of his earliest TV roles. Even as early as this in his career, McGoohan had an incredible screen presence (especially when playing the bad guy, as he was doing here). With the sun still shining brightly outside, it was time for the guided tour. Starting at the lawn adjacent to the Gloriette, "A Guide to Portmeirion" author Howard Foy ushered attendees on a whistle stop tour of Portmeirion's history, which finished 50 minutes later on the lawn behind Government House. 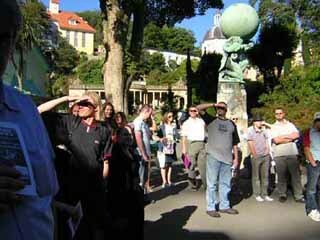 As someone who has visited Portmeirion over 30 times in the last 20 years, I was amazed at how much information and many locations Howard was able to squeeze into the tour, and this reviewer learnt several things he hadn't heard before! 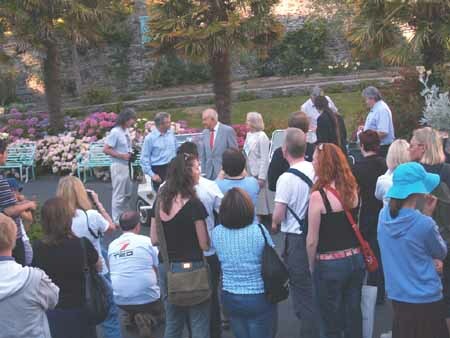 Howard Foy's Portmeirion Guided Tour. The tour party then moved back to the Central Piazza for a photo-shoot with our special guests, accompanied by our 2 resident Mini Mokes. If any item summed up the event for me, it was this one. Guests, event organisers, and fans mingling and laughing and I for one could have stayed for hours. L-R: Eric Mival, Peter Graham Scott, John S Smith. L-R: John S Smith, Eric Mival, Peter Graham Scott, Mimi Scott, Rick Davy, Dave Jones. Rick Davy, John S Smith, and Dave Jones. Attendees gather in the main piazza for the photoshoot. Next on the timetable was a return to the Hercules Hall for our 4th special guest. Peter Graham Scott is one of the world's most highly regarded Directors and Producers, counting "The Prisoner", "Danger Man", "The Onedin Line", "Jamaica Inn", "The Troubleshooters", "The Avengers", and "Children of the Stones" amongst his credits. Even at the age of 82, Peter's sharp mind, memory, and catalogue of anecdotes had not diminished and it was a real pleasure for this reviewer to witness the interview. 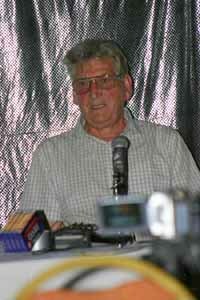 Peter talked at length about his time in the TV and Film industry, including working on "Danger Man" and "The Prisoner", speaking frankly at all times (including his reasons why the original choice for Number 12 in "The General" was dismissed in favour of John Castle) and providing many laughs along the way. One particular highlight was a comparison of Patricks McGoohan and Macnee, and another being Peter's views on location and studio filming. Peter and interviewer Dave Jones struck up a great rapport, and I'm sure I can speak for all when I say that I could have stayed and listened all night. Peter Graham Scott talks about his life and career. For the finale of the day's activities, our special guests reunited on stage for a special screening of the episode "The General", with all the guests (ably moderated by Dave Jones) airing their remembrances of the making of the episode. There were countless comments and anecdotes from the filming, with Peter Graham Scott's description of Norman Mitchell as "always available" standing out as a highlight. 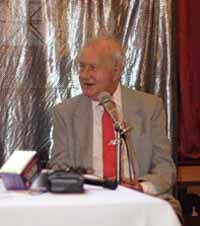 Attendee Alan Jones sent us this comment, which puts into words better than I the success of this part of the timetable: "During the live commentary over The General, I found myself watching Peter Graham Scott a lot more than the episode. The delight on his face as he re-viewed and recollected his work on certain scenes was a memory that I shall cherish." Our guests line up for a screening of "The General". With the timetabled events now at a close, it was time for the prize giving and auction. First up was the quiz. With no less than 9 people getting 10 out of 10, and only 3 prizes up for grabs, a draw was made and Frank Shailes, Sheila Howell, and Erica Kendrick were the winners - winning signed photographs of "Prisoner" actors Rachel Herbert, Michael Nightingale, and Angela Browne. The charity auction came next. 4 items were auctioned - a 1977 Portmeirion guide book signed by Sir Clough, a signed George Markstein novel (donated by special guest Eric Mival), a Prisoner vinyl single, and a 1928 first edition Portmeirion guide book. Gary Murfin, Giles Kendrick, Andrew Frith, and Rob Fairclough bid highest for the items and a total of £170 was raised for the charity! Next up was the prize raffle, with what seemed an endless supply of prizes won by various attendees (including one of many who had bought tickets via Paypal and could not attend). Top billing was given to 2 original production stills from 1966, won by attendee Francis Robertson, a script for an unmade McGoohan series "The Outsider" won by Ronnie Soo, and a full set of Robert Fairclough's original proofs for "The Prisoner: Official Fact Files", which was won by Jan Davis. Rick Davy and Dave Jones draw the winning tickets. The day's events wrapped up with a chance for attendees to mingle and chat in the Hercules Hall bar, kept open exclusively for ticket holders until 10.30pm. The following morning, those staying in Portmeirion accommodation had a further chance to chat with the guests over breakfast, and the charity total donation was finalised. Eric, John and PM2005 photographer Nick Bennett outside the main hotel. Photo © Ann Pearce / The Unmutual 2005. We are proud to announce that the total profit* from the event, and therefore donated to Ty Gobaith, is £1042.48. We would like to thank everyone who attended and supported the event and helped to raise this magnificent total. 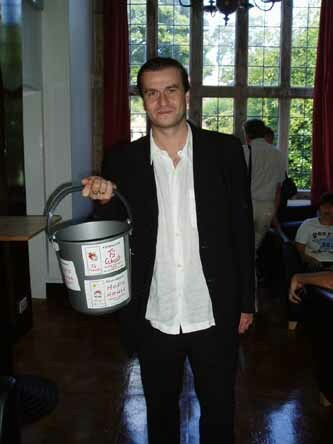 Event co-organiser Rick Davy with the charity collection bucket. If you would like to tell us what you thought of the event, please email us and have your comments included here! "I just wanted to thank you for PM 2005 last weekend. We had a fantastic day and we thought it was superbly organised." 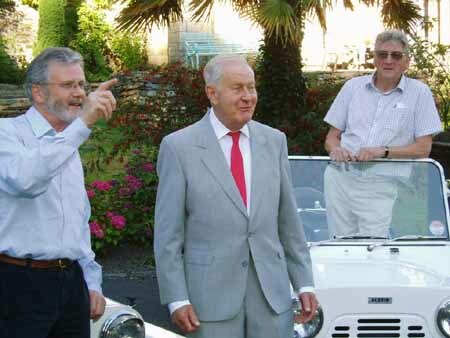 "Just wanted to drop you a line to say well done with regards to the Prisoner/Patrick McGoohan event; I and my party enjoyed it very much - Portmeirion is a beautiful place!...... You should be very proud for making sure the day went successfully." "This is just to say that my husband and I had a wonderful time at PM 2005. Many thanks for organising it." "A big thanx to yourself and all the clan at the Unmutual camp for a great day/evening! it was great to see faces from the past and catch up with folk from far and wide!!!" "Just a quick note to say how much we enjoyed PM2005. It was a cracking day and we had such a high that we stayed on until Tuesday! Well done, and thanks!" "I thought it was a grand day out and more power to Rick and co's collective elbows." "Thank you for organizing the Convention. I thought it was wonderful - so much better than recent Six of One conventions. 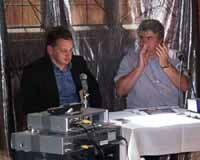 There was a nice, friendly atmosphere and the guests were very entertaining - especially Peter Graham Scott. The highlight for me was the hilarious 'The Greatest Man in the World'. I can't wait for the next one!" "I had a most enjoyable day and I echo other's comments about the professional attitude of the organisers and friendly atmosphere. All four guests were genuinely nice people and appeared to have had an enjoyable a day as everyone else. Well done and many thanks to all who turned up and made it happen." "It was a terrific day and a credit to all concerned. As well as the smooth running of everything, what impressed me most were the guests; SUCH nice people, and all more than willing to "mix and mingle" throughout the day." "It really was a fantastic day - It couldn't have gone better. The atmosphere was so informal and relaxed and all four guests were absolutely fantastic. The screenings were varied and fun - very refreshing. All this, and raising over £1000 for the childrens hospice - you should be very proud of yourselves. Here's to the next one :o)"
"I just wanted to drop a line to say how much I enjoyed the convention. It was my first visit to Portmeirion & it made it extra special. 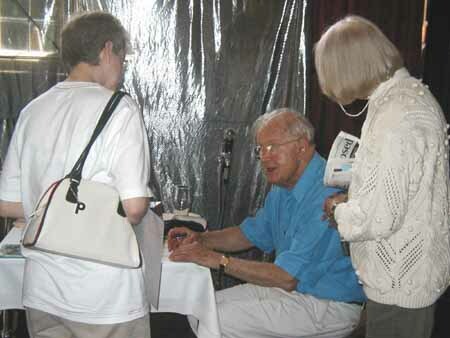 It was great to meet the guests & be entertained by Peter Graham Scott's stories. Plus I picked up a few things from the dealer tables that I had been after for a few years! I look forward to getting the DVD when it is ready & look forward to the next event. Its nice to learn that PM2005 was such a success for you too." 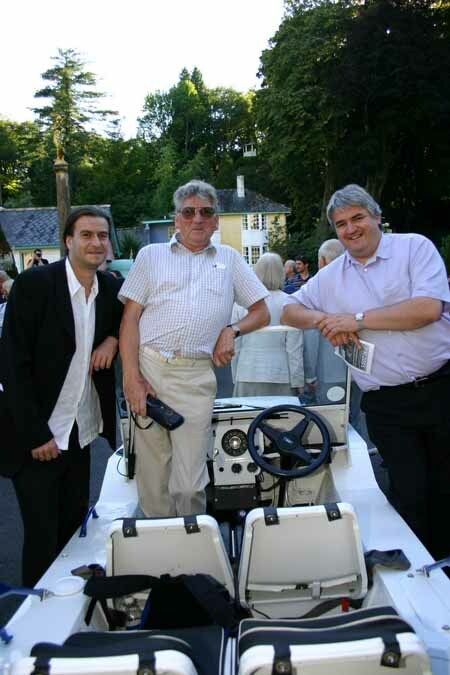 "Just like to say how much my wife and I enjoyed the PM2005 event at Portmeirion. The weather was gorgeous, the company was excellent and the whole day extremely well organised. It was such a pleasure to step back into the village after a break of several years to find that, in reality, little had changed. The Hercules Hall became alive once more with guest interviews, video screenings, side stalls and of course the active bar area where many congregated to renew old friendships. In fact the one word I would use to describe the whole day was "friendly". It was such a pleasure to meet up with so many old acquaintances (most of whom had changed little in the intervening period). The highlights of the day were too numerous to mention (although civilised tea, on the Hotel lawn in the glorious sunshine, with some old friends was particularly memorable). I'd like to express my thanks to all of the organisers. They did a fantastic job in not only getting the event off the ground but also made sure that it stayed successfully in the air and landed safely with a mammoth cargo of cash for charity. Take a bow everyone!" " Just want to add my thanks and congratulations for the PM 2005 event. I had a thoroughly enjoyable day in a friendly, relaxed atmosphere. The guests were entertaining and very approachable." "It was a pleasure to attend a Prisoner convention which had such noble aims and for it to have raised over £1000 for such an important charity is fantastic. 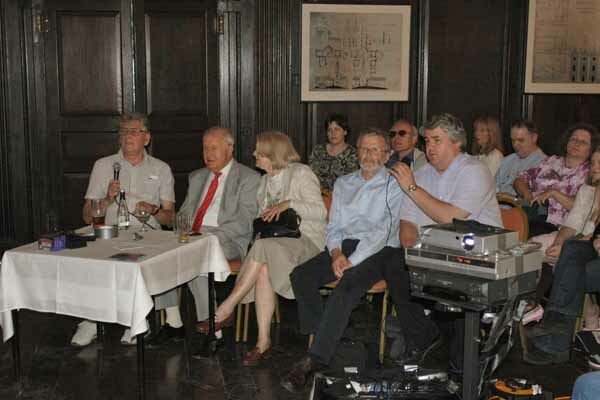 I'm sure all will agree that there was a really nice, friendly and positive atmosphere throughout the event, thanks to the upbeat personalities of yourself, Dave, and Roger G, and the interesting anecdotes/background info from the four guests. This is the way conventions should be run; with a mature intelligent approach, focusing on solid information presented in a welcoming style. Well done!" "Having been to other conventions over the years it was great that the organisers encouraged guests and attendees to mingle. I remember attending one event where a guest actor actually couldn't remember being in the programme in question (having only had one line!) so to have such well informed guests who had spent months or years working on the Prisoner was fantastic. To be able to share their such happy memories as they came back to them during the "Directors" voice over was a real joy! Heres to the next one!!!!" "A grrrreat event and well done with the charity funds - well deserved acclaim for all the hard work." "I thought there was a lovely mixture of relatively new fans, (some people I met on the London Walkabout, or got to know through my chatroom and met in the flesh yesterday for the first time), old friends, and Prisoner enthusiasts I hadn't seen since the 70's who resumed conversations as if that were indeed just yesterday! There was a superb atmosphere. All were good-humoured, relaxed, got on really well together, and in addition to enjoying the day 'dug deep' for our charity too. And outside the sun shone, and shone like it meant it! The silver band played 'Men of Harlech' and I contemplated the passing scene and the Village in all its glory with a Portmeirion chocolate ice cream in my hand - because for some occasions only chocolate will do." "Thoroughly enjoyed the day, especially seeing some of McGoohan's early screen appearances, the Armchair Theatre one was certainly something different..!" "Oh man, where to start! The best part of the event, if anyone can choose a best part, was actually the friendly, informal manner with which *everyone* approached each other. It was nice to meet up with old friends and make new ones. The guests were so cool. Nick and I had a drink with Eric Mival and John S. Smith on the hotel lawn. We later gave them coffee and a guided tour of Angel cottage. I also helped them brush up on their Welsh! They both expressed an interest in staying at Portmeirion in the future. If they do, I want commission! ;-) Rob Fairclough gave an interesting interview and I later enjoyed a chat with him and bought a copy of the Prisoner Scripts which is a fascinating work. Peter Graham Scott was a lovely old chap. 82 but full of the joys of life. During the live commentary over The General, I found myself watching him a lot more than the episode. The delight on his face as he re-viewed and recollected his work on certain scenes was a memory that I shall cherish." 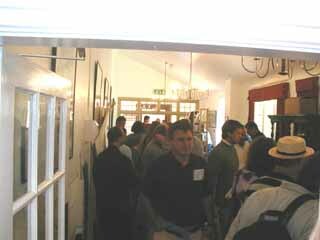 "A suberb day - just like the first Portmeiricons I went to in the eighties only with even more new screenings and guests. Peter Graham Scott was straight talking and great fun. Eric Mival, John S Smith and Rob all as fan friendly as ever but it must be said PGS rather stole the show this time...."
"We both enjoyed the day, it was really good. The director's commentary was so funny, I really hope that ends up on the DVD or at least some of it, we just got back home last night as we had been driving all over Britian for the last week, and we kept talking about that commentary all the time, it would be great if it was included in an official Prisoner DVD box set." "We all had a wonderful time, the event was first class and what a coup to be back in the village again for a Prisoner event in the summer. It was just like old times." "I'd just like to say what an absolutely fantastic time I had at the one-day convention. This is Prisoner/McGoohan fandom all grown up and at its best! I must say that the mature approach to the event items was refreshing and nobody had a frown on their face all day. It was brilliant to hear more anecdotes, even this many years on and that The Prisoner can still be kept fresh in that respect. I heard things about Mcgoohan that I hadn't heard before, such as his involvement in little things. I bow down to Howard's knowledge as he barely looked at his notes when he got into the swing of it. 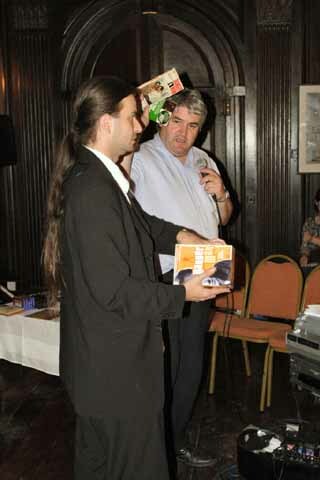 It was great to win a prize and to have my book signed as the people are sadly dwindling out. Brilliant amount raised, well done! Looking forward to the next one!" 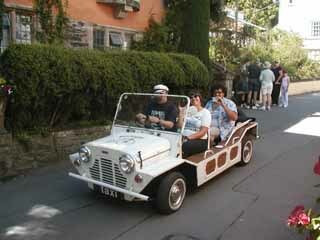 "I had a great time - let me know when the next one is, and I'll be glad to bring the Moke again." "A big thank you to all concerned for PM 2005. A great success all round. Peter Graham Scott was particularly memorable. It was really nice to see all the old faces again." "Belated thanks for a fantastic convention. The whole day was fun, informative and engaging." "Thank you very much for arranging it all. 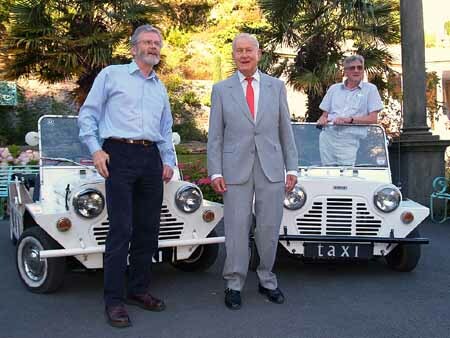 I found the event both interesting and hugely enjoyable being back in Portmeiron and remeeting my old colleagues Peter and John, and meeting Mimi for the first time." "Thank-you for a wonderful weekend." "Excellent news about the money raised." "Many, many congratulations on your successful event! The weather that weekend if my memory serves me correct was glorious, so with the setting at Portmeirion, no doubt an enjoyable day was had by all. We are extremely grateful and thankful for the profit from the event which will be donated to Ty Gobaith. On behalf of the children and their families who will benefit through your generosity, please accept my heartfelt thanks." A 2-hour DVD of highlights from the event is now available - click HERE for more details. A small number of Event Programmes are still available for purchase in aid of the charity. 12-pages A5 black-and-white including guest profiles, timetable, weblinks, photos, and a history of Portmeirion. £2 plus postage - contact us for more details. Peter Graham Scott, Mimi Scott, Eric and Penny Mival, Robert and Rachel Fairclough, and John S Smith for giving up their weekend to attend and support the event. Meic Williams and Robin Llywelyn of Portmeirion for their help in staging the event, and for giving it such prominence on the Portmeirion website. Granada Media for official permission to screen items from their archive. Grant Taylor, Jaz Wiseman, Umbrella Entertainment, and The AV Channel for their kind permission to screen the "Danger Man" commentary. Eluned Yaxley of Hope House for allowing us to link up to the charity. Simon Coward for obtaining screenings permission, and running the screenings on the day, with the help of Jane Rowe. Jill Mills and Frank Shailes for running the merchandise and raffle stall. 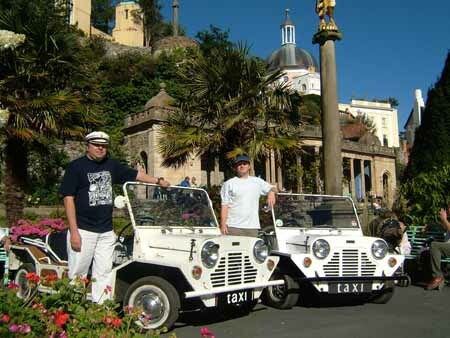 Sam Denham and CH for bringing their Mini Mokes to Portmeirion, and donating their Taxi ride fares to the charity. Howard Foy for running the guided tour. 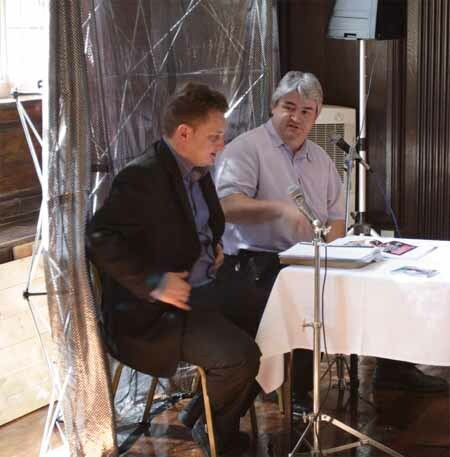 Mathew Lock and Giles Kendrick for filming the event. Brian Watson, Ann Pearce, and Andrew Wooly for providing audio equipment free of charge. Kate Foy for helping on the door, Allan Young for printing all the programmes free of charge, and Roy Fishwick for doing the same with the quiz. Michele Wilson and Lew Stringer for helping to promote the event, Mathew Lock and Peter Dunn for additional guest liason. Ceri Jones, James Goldthorpe, and Rebecca Ford for going round the hall all day with the charity bucket, and Alan Jones, Nick Bennett, and The Dudley Arms Hotel, Llandrillo for their extra donations. Auction items donated by: Eric Mival, Gareth Hughes, Steve Watson. Quiz Prizes donated by Vaughan Brunt. Raffle Prizes donated by: Rick Davy, Lew Stringer, Frank Shailes, Michele Wilson, Steve Watson, Leslie Glen, Brian Watson, Nigel Kitcher, Robert Fairclough, David Mackenzie, Alan Jones. *Full detailed financial accounts for PM2005 can be found HERE. 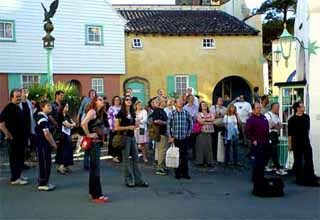 PM2005 was an independent event organised by The Unmutual Website and PrizBiz, with the kind permission of Portmeirion and Granada Media. The event had no involvement whatsoever from any Society or fan-club. Photos and text from this page may not be reproduced on any other website or in any publication without our expressed permission. 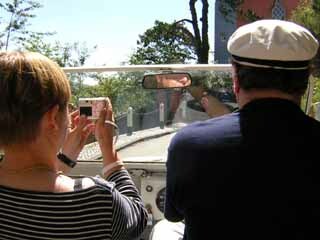 Photos are © the individual photographers and The Unmutual Website 2005.